The deployment of electrical equipment in potentially hazardous or explosive areas has been a major concern since the beginning of the 20th century. Supported by the need to achieve accuracy and safety in volatile zones and the implementation of government regulations globally, the market for hazardous area sensors has received a significant boost over the years. Fueled by the growing importance of intrinsic safety in many manufacturing facilities, including oil refineries, textile mills, chemical plants, and paint manufacturers, the global market for hazardous area sensors is poised to expand at a 4.6% CAGR during the forecast period of 2015 to 2023, rising from a value of US$4.5 bn to US$6.7 bn therein. Despite the fact that hazardous area sensing has existed for a considerable period of time, the number of players dealing with hazardous area sensors are limited. There are, however, a comparatively higher number of suppliers providing raw material to manufacturers. The global market for hazardous area sensors has been geographically segmented into Asia Pacific, North America, Europe, and Rest of the World. 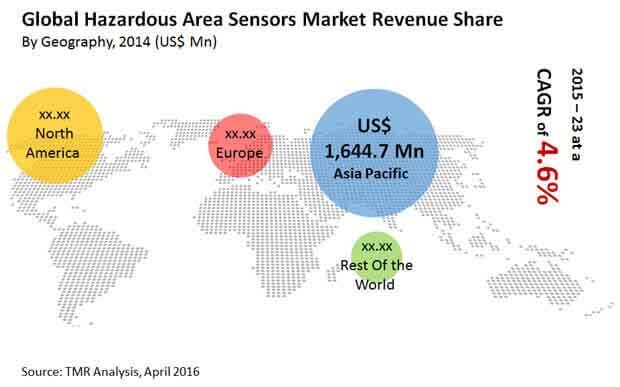 Asia Pacific has been the leading revenue generator in the hazardous area sensors market with a share of more than 35% in 2014. The region is expected to retain its lead throughout the forecast period owing to high economic growth in countries such as India and South Korea. In addition, the rapid growth of various industrial sectors and the increasing importance attributed to intrinsic safety in most industry verticals have been instrumental in driving the hazardous area sensors market in Asia Pacific. North America has been just as significant a market as APAC, fueled by the replacement of existing hazardous area sensors and the constant upgrade of legacy systems. The growth in certain sectors, such as shale gas exploration, waste and sewage management, and healthcare, is also likely to boost the hazardous area sensors market in North America. The regional market, along with Europe, is considered to be rather mature and is thus estimated to exhibit sluggish growth over the next few years. Despite holding a minimum share in 2014, the hazardous area sensors market in the Rest of the World is anticipated to register the fastest growth rate from 2015 to 2023. This segment is projected to be fueled by the oil and gas as well as the mining and metal industries. Several countries in RoW, such as Brazil and South Africa, have been emphasizing on intrinsic safety in the industrial sector. As an increasing number of countries follow this trend, the hazardous area sensors market is likely to receive an impetus during the forecast period. The prominent applications of hazardous area sensors include oil and gas, power, mining and metal, healthcare, grain storage, chemical, waste and sewage management, pharmaceutical, and fertilizer. The use of hazardous area sensors in the oil and gas sector has been significantly high and over the forecast period from 2015 to 2023, this application segment is expected to lead the overall hazardous area sensors market. The rising demand for shale gas and coal gas, coupled with increasing exploration for new gas fields, has been positively impacting the market. Servomex Group, Ltd., Neo Monitors AS, Eaton Corporation Plc, Sick AG, Mettler-Toledo International, Inc., ABB Group, Yokogawa Electric Corporation, Honeywell International, Inc., Endress and Hauser, and Siemens AG are some of the leading players in the global hazardous area sensors market. This report provides strategic analysis of the global hazardous area sensors market, and the growth forecast for the period 2015 to 2023. The scope of the report includes competitive analysis of various market segments based on the types, application industry, and in-depth cross-sectional scrutiny of the hazardous area sensors market across different geographical segments. Hazardous Area Sensors refer to sensors which have been developed for usage in potentially explosive environments. The growing importance for ‘Intrinsic Safety’ across various industry verticals is primarily driving growth of the hazardous area sensors market. Additionally, increasing stringency of government legislations and policies across the globe, governing hazardous area certified products, have been compelling users of hazardous area equipment to adhere to strict classification standards and certifications. This in turn is also steadily boosting growth of the global hazardous area sensors market. Furthermore, the renewed interest in shale gas and ‘coal gas’ has led to growing explorations for gas beds which in turn has aided in increased application of hazardous area sensors. Considering the positive impacts of the factors mentioned previously, the hazardous area sensors market can be anticipated to grow steadily during the forecast period. On the basis of types, the hazardous area sensors market has been segmented into gas sensing, pressure sensing, current sensing, voltage sensing and temperature sensors. The market revenue for hazardous area sensors has been provided in terms of USD million, along with the CAGR for the forecast period from 2015 to 2023. Application industry covered under this report includes power, oil & gas, mining & metal, grain storage, healthcare, chemical, pharmaceutical, waste & sewage management, fertilizer among others. Each of these segments provide market size and forecast for the period 2015 - 2023, highlighting the key trends influencing and challenging factors for each segment. The regional market analysis gives in-depth analysis of the current trends in different regions including North America, Europe, Asia Pacific, and Rest of the World (RoW). South America and Middle-East & Africa are covered in ROW. To aid in strategic decision-making, the report also includes competitive profiling of leading players in the industry, their market share, various business strategies adopted by them, and recent developments. The key trends analysis provided in the report discusses the various technological advancements and sensor types available currently, with a focus on the future penetration of these products. The value chain analysis included in the report provides information on raw material suppliers, manufacturers, distributors and consumers. The market attractiveness analysis and Porter’s five forces analysis included in the report provide insight into market dynamics, industry competition, and the most profitable segments in the hazardous area sensors market. The regulations section included in the report details the various regulations which are currently in effect across the globe. Additionally, the report also details the top players for each region and by each type, along with the top 10 suppliers of hazardous area sensors in each region. The report also provides breakdown and assessment of various factors impacting the market growth, which are suitably described as market drivers, restraints, and opportunities. These factors determine various existing trends and their impact on market growth. Overall, taking into consideration the various factors affecting the hazardous area sensors market, the report includes a holistic analysis of the global hazardous area sensors market, and provides an estimate of growth for the forecast period 2015 to 2023. Some of the leading players in the market Yokogawa Electric Corporation (Japan), ABB Group (Switzerland), Siemens AG (Germany), SICK AG (Germany), Endress and Hauser (Switzerland), ABB Group (Switzerland), Mettler-Toledo International, Inc. (U.S.), Neo Monitors AS (Norway), Honeywell International, Inc. (U.S.), Servomex Group Ltd. (U.K.) and Eaton Corporation Plc (U.S.) among others.